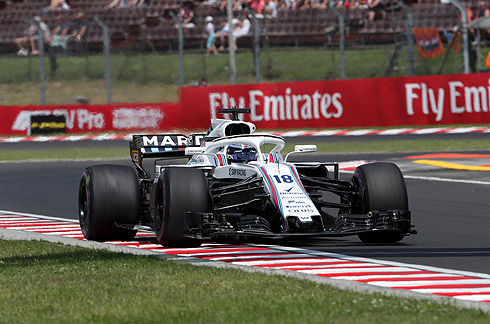 The results of the 2018 HUngarian GP would again see the Williams Martini drivers finish well down the order with Sergey Sirotkin and Lance Stroll finishing in 16th and 17th. The pair would start on a split strategy with Sergey on the soft tyre and Lance the medium. For Lance his race would see him start from the pit lane after having to revert to the old style front wing after the new one was damaged in qualifying. It was an uneventful race for both drivers but again they simply lacked any real pace. 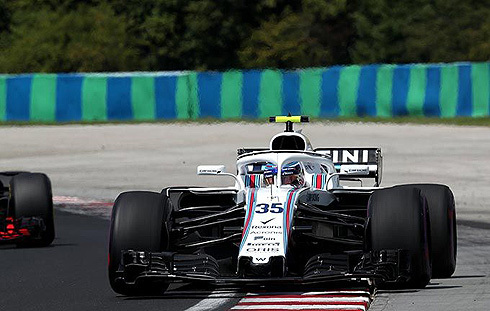 Even before the start of the seventy lap 2018 Hungarian Grand Prix the Williams team would announce that Lance Stroll would have to start the race from the pit lane due to the fact that the team had to revert to the old front wing on his car as they did not have a spare to replace the new one that was damaged during qualifying. So the Williams drivers will start from 19th and the pit lane. Not the best of starts to the event. The race would be run under sunny skies with very high temperatures a big change from Saturday. With qualifying run under wet conditions the drivers would have a free choice of tyre for the start of the race. On pole was Hamilton from Bottas, Raikkonen, Vettel, Sainz, Gasly, Verstappen, Hartley, Magnussen and Grosjean in tenth. On the grid of the top ten only Vettel and Sainz were on the soft tyre with the rest on the ultrasoft. 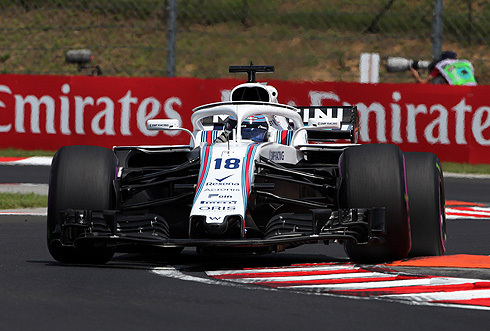 For Williams Sergey was on the soft and Lance the medium with the majority of the field outside the top ten were on the soft tyre. Only Ericsson and Perez were on the ultrasoft tyre as the grid moved away on their formation lap. They would return form up and the lights would go out and it would be Hamilton leading from Bottas Vettel and Raikkonen. Verstappen was fifth while for Williams Sergey was 17th and Lance 19th. Gasly was sixth followed by Magnussen and Sainz. Ricciardo was waay down in 16th after a poor start. Leclerc would retire on lap two. Sergey was right behind Perez while at the front on lap five Hamilton was leading by 3.9 over Bottas. Verstappen would drop down the order having slowed with a no power issue reported from the driver. This would see him pull off to retire. Sergey and Lance were now 16th and 17th with Lance having passed Ericsson while the Sauber pitted. Lap thirteen and Gasly was fifth followed by Magnussen, Sainz, Hartley, Hulkenberg, and Grosjean tenth. Lap sixteen and Ricciardo would pass Grosjean using his DRS at Turn one. He would get past Hulkenberg for ninth while the Williams drivers were still running in 16th and 17th. Lap twenty one and Raikkonen would pit returning in sixth running on the soft tyre. Hamilton was now leading by 6.2 seconds over Bottas. Bottas would also pit the next lap also going to the soft tyre. Hamilton was now leading from Vettel and Gasly third. Lap twenty five and Raikkonen would pass Magnussen for fifth. Bottas would pass Gasly moving into third. Ricciardo was looking to pass Magnussen but the Hass driver was making it very difficult. But Ricciardo was able to get past him and move into sixth. Vettel was closing the gap to Hamilton with it down to 6.2 seconds on lap thirty one. Perez would pit from 15th seeing the Williams drivers now 15th and 16th. Lance would go a lap down on lap thirty four while Hulkenberg would pit coming back out in 14th ahead of Sergey. Hamilton would pit seeing Vettel now leading. Hamilton now second and on the soft tyre. The order was Vettel leading Hamilton, Bottas, Raikkonen, Ricciardo, Gasly, Magnussen, Grosjean, Alonso, and Vandoorne tenth. Sergey was now a lap down with the Williams driers having a very uneventful race still in 15th and 16th. But Perez would pass Lance for 16th using his newer soft tyres to good effect. Sergey would pit on lap thirty five returning as the last driver running and on the medium tyre. Lap thirty six and Vettel was still leading but he had very used soft tyres. He was losing time to Hamilton with his lead now down to 9.5 seconds. The traffic was costing Vettel a lot of time as Raikkonen pitted again on lap forty. Vettel would pit the next lap and would take on the ultrasoft tyre. Vettel would return behind Bottas and Ricciardo now fourth. The top ten was now Hamilton from Bottas, Vettel, Ricciardo, Raikkonen, Gasly, Magnussen, Alonso, Vandoorne and Sainz in tenth. The Williams drivers were still in 16th ans 18th. Ricciardo would pit coming back out in fifth behind Raikkonen running on the ultrasoft tyre. Lance would pit on lap fifty one taking on the ultrasoft tyres. The Williams drivers were now 17th and 18th. Vandoorne would retire at the side of the track seeing the Virtual Safety Car come out for a short period. Lance was now two laps down and twelve seconds behind his team-mate. Sergey would go two laps down on lap sixty one. The final laps of the race would wind down with Hamilton leading comfortably to the end . Bottas was able to keep Vettel behind him with Raikkonen running behind his team-mate in fourth. But Vettel would finally make his move using his DRS to get alongside of Bottas coming out of Turn one and going into Turn two. Vettel would get alongside Bottas and the pair would make contact seeing Bottas get damage to his front wing. He would continue in fourth behind Raikkonen. Ricciardo would close the gap to Bottas and try to get past using his DRS going into Turn one and the pair would make contact with Bottas having run wide. 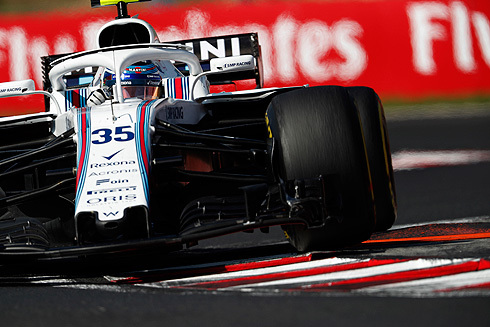 Bottas was able to continue in fourth and Ricciardo fifth. This incident would be investigated after the race. Bottas was told to give back the position to Ricciardo and the Red Bull would get past after Turn one going into fourth. With the finish of the race Hamilton would win the 2018 Hungarian GP. Vettel was second followed by Raikkonen, Ricciardo, Bottas, Gasly, Magnussen, Alonso, Sainz and Grosjean tenth. 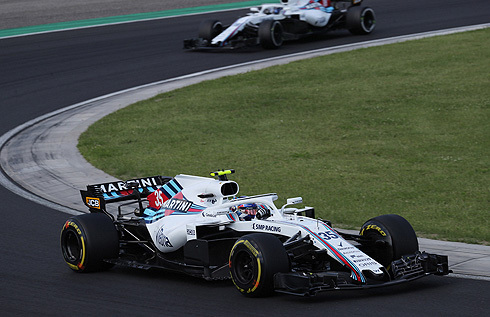 As for Williams their drivers would finish in 16th and 17th in what was an uneventful race for both drivers but again they simply lacked any real pace.